(Agent‑less Linux/Windows PNs) Enroll protected nodes. To prevent this problem, on the VMware‑hosted PNs, switch the NIC type from E1000E to E1000. a. Enable ssh on each ESXi/ESX server in the vMotion cluster. b. Reserve 1 to 3 unique static IP addresses for each PN proxy type (Linux and Windows). The more proxies you configure, the more concurrent backups onQ can perform. c.	Log on to the HA’s onQ Portal. d.	Click the PROTECTION CONFIG tab > double‑plus button (++). The Add Protected Nodes via Host dialog appears. e.	In the Server Type field, select the vCenter radio button. f.	Provide the vCenter credentials for any user with root privileges and either the hostname or the IP address for vCenter, then GET LIST. The Add Protected Nodes via vCenter dialog appears. The onQ Portal queries the virtual machines managed by vCenter, then displays the inventory. g.	Provide ESXi host credentials for any user with root privileges, specify proxy information for each proxy type, and select the check boxes for the PNs that you want to enroll. If an expected virtual machine does not appear in the list, it’s likely that the virtual machine does not have VMware Tools installed. Provide the network properties for each proxy. Use the unique IP address(es) that you reserved above. If more than one IP per proxy type, provide a comma‑separated list. •	Windows proxy address. The static IP address that you reserved for the Windows PN proxy. •	Linux proxy address. The static IP address that you reserved for the Linux PN proxy. •	Proxy subnet mask. The PN proxy’s subnet mask. •	Proxy gateway. The PN proxy’s gateway. •	Proxy VM Data store. The directory in which the vm’s files are stored. •	Proxy VM Network. Your network configuration can include a vCenter-level Distributed Virtual Switches (DVS) or an ESXi host-level virtual switch. When you enroll an ESXi host, all available networks that are visible to that host are listed and available for selection. Click the ENROLL button, then OKAY. The PNs that you selected appear in the Protected Nodes list; however, they are unverified as evidenced by the status in the PROTECTED NODES page > Protection Disabled column. h.	From the ESXi/ESX host, power on the PN proxies. i.	Activate (aka verify) the PNs so that onQ can protect them. Go to PROTECTION CONFIG tab, select the PN, then click the MODIFY button. Specify values for the node parameters, then SAVE. The act of saving a PN’s configuration instructs onQ to activate that PN’s configuration. If the PN is a Linux PN, onQ cannot enroll these XFS mount points automatically, so you must do so now. See Linux Filesystem Format Requirements. 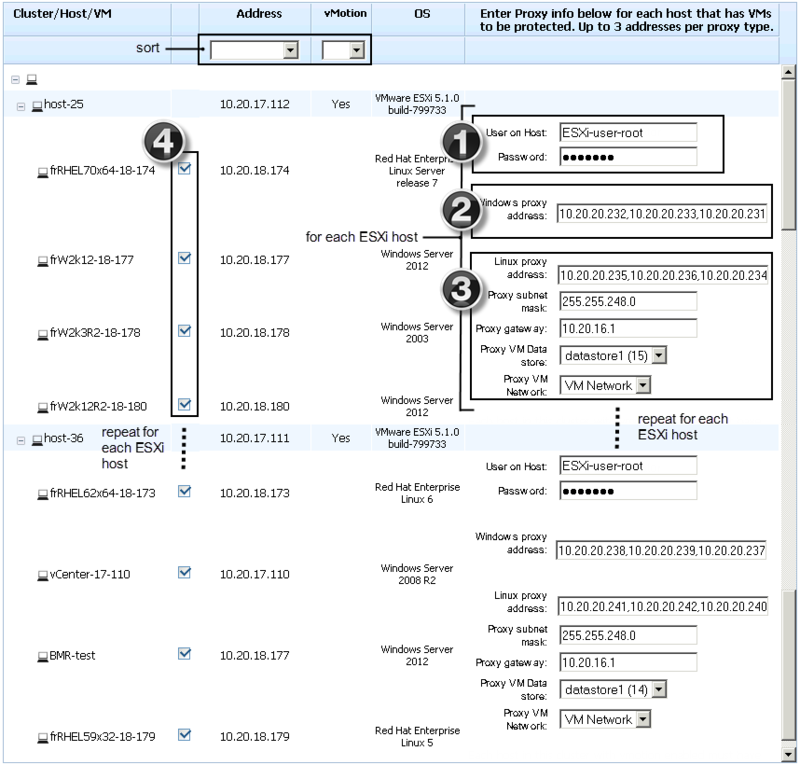 The onQ Portal groups the PNs by ESXi server. If you do not want these PNs in such a group, clear the default Group Name field to remove the PNs from this group and place them in the shared pool. 2. Log on to the PN and open the following ports on the firewall in order for onQ to communicate with the PN. 4. (Oracle database) Install RMAN scripts. If the PN has an Oracle database, install the RMAN scripts so that onQ can execute a hot backup of your database as outlined in Back up and restore Oracle 10g+ database on Windows. 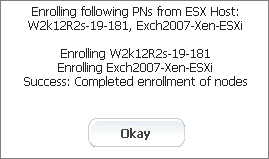 Use this procedure to enroll an agent‑less Windows PN that’s being hosted my an ESXi server. Warning: If your Windows 2012 PN is running on the VMware host and uses the VMware E1000E network interface adapter, squirt-server might receive a corrupted source.info from squirtcopy due to a problem with VMware’s NIC, as outlined in VMware KB 2058692. To prevent this problem, on the VMware‑hosted PNs, switch the NIC type from E1000E to E1000. a. Enable ssh on the ESXi/ESX server. e.	In the Server Type field, select the ESX Host radio button. f.	In the User Name and Password fields, provide the ESXi/ESX host credentials for any user with root privileges. g.	In the Server field, provide either the hostname or the IP address for the ESXi/ESX host, then GET LIST. The onQ Portal queries the virtual machines hosted by the ESXi/ESX server, then displays the inventory. h.	In the virtual machine list, select the check boxes (or ALL button) for the PNs that you want to enroll. Provide the network properties for each proxy. Use the unique IP addresses that you reserved above. i. From the ESXi/ESX host, power on the PN proxies. j.	Activate (aka verify) the PNs so that onQ can protect them. 3. (Oracle database) Install RMAN scripts. Use this procedure to enroll an agent‑less Linux PN running RHEL 7.0 and that’s being managed by vCenter. 2. Create the grub boot menu. In order to boot the RN successfully, the PN needs to prepare the init ram disk image with the required drivers and legacy grub boot menu. b. Make sure ext2/ext3/ext4 file systems utilities are installed. c.	Generate the init ram disk with xen drivers and ext4 file system modules. Where the 3.10.0-123.13.2.el7.x86_64 is the kernel release by default, change vmlinuz and initramfs to match PN's kernel release. The kernel parameters are on a single line. Simply copy and paste from following screen. Where the root=UUID=855cd484-3852-4984-b568-ee0408c6b590, the 855cd... (UUID) is a temporary placeholder and will be replaced by read “/”'s UUID during the RN build. Do not make any changes to this parameter. 3. Wait for the RN to build, then perform a self‑test. Mistakes with the grub boot menu enforcement can prevent the RN from booting. The following list represents the most common errors. •	Kernel parameters are not on one single line. Some file editors wrap long parameters. •	You have a typo in grub.con or grub.conf.xvf5 file name. •	You have a typo in the kernel file name or the initramfs file name, or these files don’t exist. 4. Log on to the PN and open the following ports on the firewall in order for onQ to communicate with the PN. By default, RHEL 7.0 has introduced a new firewall service, a dynamic firewall daemon known as firewalld, instead of iptables service by default; however, the traditional iptables service is supported if installed. For details, see the Red Hat Linux 7 Security Guide. If you choose to disable firewalld, there is no need to configure firewalld firewall rules: simply skip this procedure. firewalld daemon and service and iptables service are using iptables commands to configure the netfilter in the kernel to separate and filter the network traffic. firewalld stores it in various XML files in /usr/lib/firewalld/ and /etc/firewalld/. The firewalld firewall defines how networks zones can be used to separate networks into different zones. Based on the level of trust, you can decide to place devices and traffic within a particular network zone. Each mutable network zone can have a different combination of firewall rules. a.	Verify that firewalld is in a running state. e.	On the PN, find the network interface that is used to communicate with onQ. In this example, that NIC is ens32. f.	For the network interface that you identified above, find the network interface’s network zone. In this example, the network zone is work. Determine your default zone. In the following example, the default zone is Public. g.	Associate the zone(s) with the following firewall rules. The same rules can be applied to many zones as needed. In the following example, dcrm-node service is associated with work zone for ens32. The dcrm-node.xml is located at /usr/lib/firewalld/services. Now the PN can communicate with onQ. i. Set up the rule for RN on the PN site. The RN will be equipped with eth0 interface, so apply the rules to eth0 interface's zone if different from PN's zone. The PN might not have eth0 interface; in such a case, the RN's eth0 will be in the default zone. Now the RN can communicate with onQ, mainly for self-tests. l.	Confirm the firewall rules. The public zone and work zone have TCP ports (5000/5990) and UDP port 5990 opened in this case. # iptables -L –n | grep -E "5900|5000"
b. If these ports are not open, open them. c.	Save and restart iptables. Afterward, verify that the ports are open and above the REJECT line as outlined earlier. 5. (Oracle database) Install RMAN scripts. If the PN has an Oracle database, install the RMAN scripts so that onQ can execute a hot backup of your database as outlined in Back up and restore Oracle 11g database on Linux. Use this procedure to enroll an agent‑less Linux PN running RHEL 7.0 and that’s being hosted by an ESXi server. Use this procedure to enroll an agent‑less Linux PN running RHEL 6.x and that’s being managed by vCenter. Note: If you want a custom boot menu, create a /boot/grub/grub.conf.xvf5 file. If .xvf1 thru .xvf4 exist, delete them because those files have a higher priority than .xvf5. 2. (Oracle database) Install RMAN scripts. Use this procedure to enroll an agent‑less Linux PN running RHEL 6.x and that’s being hosted by an ESXi server. Use this procedure to enroll an agent‑less Linux PN running RHEL 5.x and that’s being managed by vCenter. 3. Log on to the PN and open the following ports on the firewall in order for onQ to communicate with the PN. Use this procedure to enroll an agent‑less Linux PN running RHEL 5.x and that’s being hosted by an ESXi server. Use this procedure to re-enroll (aka reinstall) the Linux PN proxy or the Windows PN proxy or both. Perform this procedure on each vCenter server or ESX/ESXi host enrolled with the onQ. 1. Log on to the HA’s onQ Portal. 2. Click the PROTECTION CONFIG tab. 3. Click the double‑plus button (++). •	In the Server Type field, select the ESX Host radio button. •	In the Server Type field, select the vCenter radio button. 5. Provide the vCenter/ESXi root userid and password and either vCenter/ESXi host name or IP address, then GET LIST. •	(vCenter enrollment) The Add Protected Nodes via vCenter dialog appears. 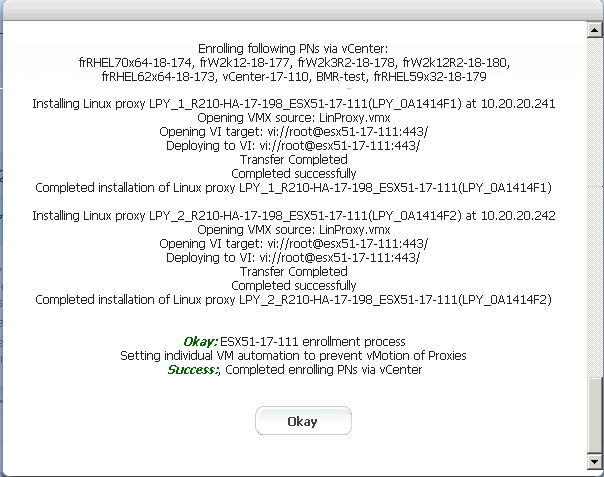 •	(ESXi Host enrollment) The Add Protected Nodes via vCenter dialog appears. The PN check boxes for enrolled PNs are greyed out. 6. In the Proxy VM Network field, reattach the virtual network adapter. 7. Select Re-install Windows proxy or Re-install Linux proxy, depending on the operating system of the proxy you’re trying to reinstall, then ENROLL. 8. Observe the messages that appear in the pop-up window to verify that the proxy reinstalled successfully.